Rebuilders –– the guys that build their own gear –– have been sub-ohm vaping for quite a while now. 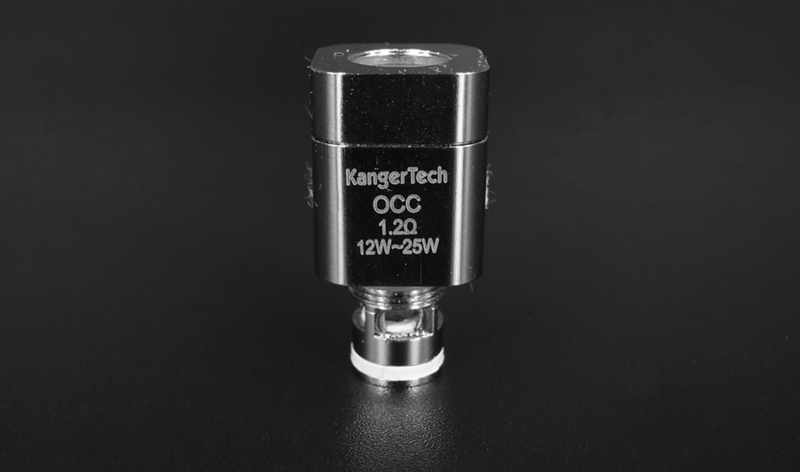 But now, thanks to a new generation of over-the-counter tanks like the Kanger Sub Tank and its Mini and Nano iterations, sub-ohm vaping is possible to all, providing you have a mod with sufficient power (20W is the BARE minimum, so aim for 30+ watts for this type of head). As it stands you have a few decent options when it comes to sub-ohm vaping with over-the-counter tanks, but two of the most well known are Aspire’s Atlantis tank and, the subject of this review, the Kanger Sub Tank Nano (AKA the newest edition to the company’s Sub Tank Range). Prior to testing the Sub Tank Mini I was using the still-excellent Aspire Nautilus on my Cloudpor Mini mod. I’d heard great things about this tank and, with tantalising prospect of sub-ohm vaping incarnate inside the Sub Tank Nano, well, I just had to give it a whirl. 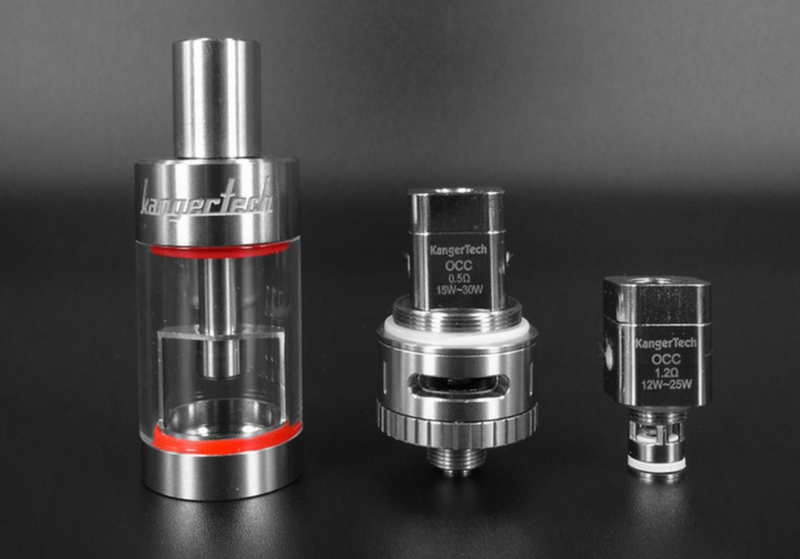 Read on for VB’s full verdict on t he Kanger Sub Tank Nano –– one of our new favourite tanks. The Sub Tank Nano ships in a very well put together and attractive box, complete with hologram (so you know its legit) and a product ID. As with a lot of cool-looking products, red and black are the order of the day here. The box itself is sturdy and, because it’s based around a sliding rather than tearing mechanism, can be reused to store the tank and its components in should you switch to another setup. Setup is simple as can be: just piece together the pieces, prime the coil with a few drops of juice, fill the tank, screw it onto your mod and begin vaping. That’s it. No screwdrivers. No nothing. Just a few screws and you’re up and running. I really like how this tank looks. It is constructed out of solid-feeling, premium metals and features very attractive red O-ring accents at the top and bottom of the pyrex tank. It can hold a MAX of 3ml of juice inside its 18.5mm diameter tank and is, as the name suggests, the smallest of Kanger’s Sub Tank line. 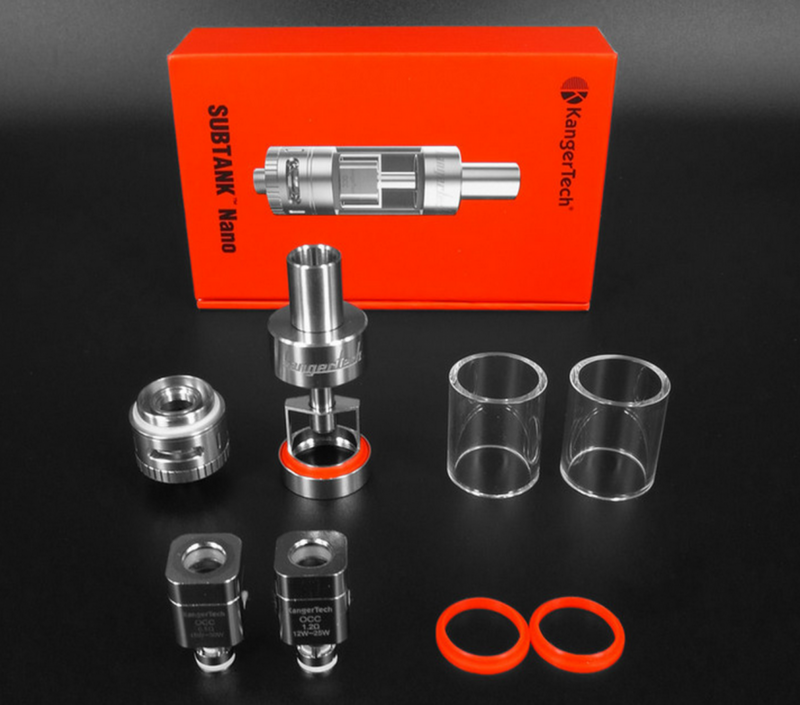 The Sub Tank Nano is 510-threaded and it features a removable drip tip. This was a very smart move on Kanger’s part because not everybody likes using metal drip tips; they have a habit of heating up and/or making your teeth feel weird. The stock drip tip is rather stubby too. I can DEFINITELY see myself switching to something longer in the not too distant future. With respect to re-filling the Sub Tank Nano, there is really only one way to do it properly: unscrew the tank from the mod and then unscrew the bottom part of the tank (the bit below the air-flow system). Do NOT attempt to do it the other way around (unscrew the top bit) while it’s still attached to the mod; the tank simply disassembles itself in your hands and this gets eLiquid ABSOLUTELY everywhere. I found this out the hard way while dining out with my better half. The BIG feature here is the 0.5ohm coil which ships inside the box alongside the equally impressive 1.2ohm coil. The former is what will get you sub-ohm vaping, but whether you prefer it to the 1.2ohm coil will depend entirely on your tastes. I tend to prefer the 1.2ohm setup for my personal preferences, but that’s just me. It’s best to try both and see which fits your personal tastes and vaping style best. Another cool feature inside the Kanger Sub Tank Nano is its OCC (organic cotton coil) head, which is made from organic Japanese cotton and basically makes eJuice taste utterly fantastic –– like, next-level-good. It’s hard to put into word, really, so you’ll just have to try it to experience just how much difference the low resistance OCC head and new wicking material makes to the overall flavour of the juice. The adjustable air-flow system is decent as well. There are three settings: 1) fully open, 2) two hole and 3) one hole. To switch between the modes, simply drag the ring around and have a toot. My personal preference is the one hole setting, as I prefer more resistance on my draw. It’s also pretty easy to modify the fully-open setting for a more bespoke draw by expanding or decreasing the extent to which it is open. In a word: fantastic. This really is one of the best tanks we’ve ever used, and while our reviews section might a smidge light at the moment (we’re a new site, so give us a break, there’s plenty more on the way) we have tested a bunch of tanks over the past couple of years as vape enthusiasts and NOTHING matches the Sub Tank Nano for power, taste and cloud production. You will need a decent mod to power the Sub Tank Nano, however, so if you’re using something below the 20W mark you might want to upgrade to something with a bit more of a punch before investing in a Sub Tank –– the 0.5ohm coil needs between 15-30W of power; the 1.2ohm coil between 12 – 25W. I’m using the Cloudpor Mini at present and I’m very impressed by the device. It’s tiny compared to some mods out there and goes up to 30W, making it an ideal companion for the Sub Tank Nano. The Kanger Sub Tank Nano is hugely impressive for a variety of reasons. The flavour you get out of it is, quite frankly, insane. The build quality and overall look and finish of the tank and the packaging it comes in is second to none. It holds enough juice for a full day’s heavy vaping and is super easier to disassemble, clean and refill. And then there’s the small fact that you CAN sub-ohm vape with it right out the box. The only thing I really don’t like about the Sub Tank Nano is the drip tip it comes with; it’s too stubby and is prone to heating up on longer draws. This isn’t a deal breaker, however, because you can easily replace it, and this is something I will almost certainly be doing inside the next few days. Beyond this it’s all good. I can’t really fault this tank in any way. Kanger really has attempted to build a tank for almost every type of vaper with its Sub Tank range. The Nano is the smallest and least offensive to your pocket, however, and for this reason I can see it fast becoming the most popular. If you want more room for liquid of the option to rebuild, check out the Nano’s bigger brother in the form of the Mini or the standard Sub Tank model. For everybody else, the Nano is likely the way forward.